I decided to make an English trifle. I’ve never made one before. I’m not sure I’ve ever eaten one before. But I decided to make one because someone gave me a trifle bowl and, well, it seemed like I should use it for its intended purpose. I started looking at trifle recipes online. Seemed pretty simple. Ladyfingers, pudding, some sort of fruit, and sometimes wine, brandy, or rum. I could do that. I couldn’t find any ladyfingers at the store. What are they? Cookies? Cake? I looked up a recipe on my phone for ladyfingers, and wow, they’re fussy. You’re supposed to separate the eggs, whip the yolks, whisk the whites until peaks form. Too much work, I decided, so I bought a pound cake and headed home. I forgot to get vanilla pudding when I was at the store. Sigh. How much did I want to make this trifle? I really, really didn’t want to go out again. On a whim, I looked up the recipe for homemade vanilla. It looked easy enough. So easy, I was ashamed I’d never made pudding from scratch before. Certainly easier than going back to the store. I’d have to let it chill overnight and make the trifle tomorrow, I thought, but that was okay. Except the next day, my homemade vanilla pudding was the consistency of a melted milkshake. Now I can make instant pudding the rest of my life without shame. 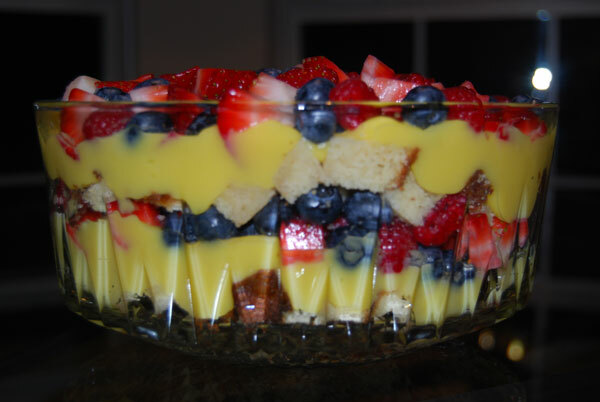 Back to the store, after all, whisked the instant pudding, and five minutes later, I was ready to put together this beautiful trifle. This recipe really is easy, as long as you get everything on your shopping list on the first trip. Visit www.susanmallery.com/recipes.php for a printable PDF of this recipe and many more. Cut the pound cake into 1-inch chunks. Put half in the bottom of a trifle bowl or any large bowl. Sprinkle with half of the brandy. Top with half the pudding, then half the fruit. Repeat the layers. Just before serving, top with whipped cream. Looks yummy. Here's my recipe for a diabetic trifle bowl. Came from my mother in law. My middle son adores it. Dissolve gelatin in water. Mix pudding with milk. In 3-quart trifle bowl layer in this order: 1/2 cake pieces, 1/2 gelatin, 1/2 pudding, 1/3 each fruit, 1/2 whip topping. Repeat layers ending with fresh fruit on top of whipped topping. Serves 12. Thank you so much, Gwendolynne! That looks delicious, too! Char, you could try sprinkling a little grape juice on the pound cake. I think it really helps to moisten it up. It was delicious!